“I would like to thank everyone who took part in our consultation about the design for the proposed HMS Hampshire commemorative wall by visiting our display at Birsay Community Hall, completing questionnaires or responding via Facebook and Twitter. 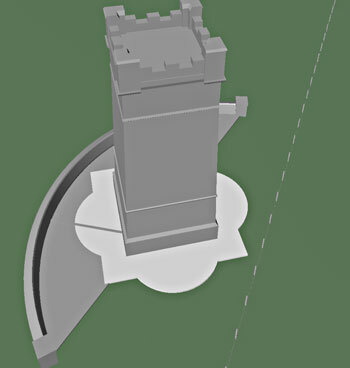 “The plan which received the most votes was the arc shaped wall, and the Kitchener & HMS Hampshire Memorial committee has agreed to proceed with this design. “We will now seek planning permission to build the wall, a little over a metre high, next to the Kitchener Memorial at Marwick Head. It will carry the names of more than 700 men who died, along with Earl Kitchener, when HMS Hampshire hit a mine and sank just off the coast in June 1916. “I believe this will be an appropriate way to “better remember” these men as we approach the centenary of their loss. “For the record, the number of votes cast for different wall shapes were 15 for the arc, 12 for the square wall, and three for the square with a cut-off corner. Two other ideas were also put forward. “The creation of a commemorative wall is part of the Kitchener & HMS Hampshire Memorial project, organised by Orkney Heritage Society with support from Birsay Heritage Trust. The Kitchener Memorial itself will be restored to its original 1926 condition, retaining its iconic profile. “The restoration and commemorative wall are to be officially unveiled at events marking the centenary of the sinking on Sunday 5 June 2016, and already a number of relatives of those who died are making plans to visit Orkney for the occasion. Meanwhile, did you catch the BBC Two Scotland two-part documentary, Scotland’s War At Sea? The first part was The Dreadnoughts Of Scapa Flow and part two – which told the story of the sinking of HMS Hampshire – was The Battle Of The U-Boats. Both programmes, presented by David Hayman, feature shots of Orkney and interviews with Orcadians. There is still time to watch these programmes on BBC iPlayer, as I write, but the clock is ticking: http://www.bbc.co.uk/programmes/b05qy7nq. And, if you are in Orkney, the classic silent film The Battles of Coronel And Falkland Islands, made in 1927, is showing at the Phoenix Cinema at the Pickaquoy Centre, Kirkwall on Friday 8 May. Described as a thrilling reconstruction of two decisive naval battles from the early stages of the First World War, the film has been restored by the British Film Institute. I will be at the cinema on 8 May, perhaps I’ll see you there.